Back for the 42nd year, the Telluride Jazz Festival features a dynamic mix of world class music and festival events including art walks and parades, experienced through luxurious pass options with upscale culinary and cocktail menus, intimate late night shows and more. The Town of Telluride also offers award-winning restaurants, unparalleled outdoor recreation and sightseeing opportunities. Here the Telluride Jazz Festival team has put together a comprehensive festival guide for the best festival experience possible! Summer is a beautiful time in Telluride! Lush hillsides boast abundant wildflowers and beautiful landscapes. In the Rocky Mountains, weather can move fast and can be sporadic. Telluride’s weather is no exception and can be a bit of sunshine, rain, overcast and everything in between during August. It’s best to be over-prepared, than under-prepared. Each day of the Festival, the gates open in the mid-morning and the event spans into the evening. During the daytime, weather can be mild and perfect for tee shirts, sandals and shorts. UV rays can be higher than you’re accustomed to and the air is dry, so we recommend that you bring sunscreen and a water bottle to fill at free water stations located throughout the venue. Nothing beats a tarp when things are looking wet! In case of precipitation, we recommend you bring waterproof, quick-dry and insulating layers. The Telluride Town Park field can get a bit muddy with rain. Wearing waterproof boots and wool or synthetic moisture-wicking socks are also encouraged. Sunsets during this time of year typically happen around 8:20 pm and can be stunning; however, be prepared for the quick drop in temperatures. Even on a warm day, temperatures can swing more than twenty degrees in a matter of hours. We recommended that you bring a change of clothing layers for this evening shift. Hats and long underwear are all great items to bring to the show in a backpack. Camping at the Telluride Jazz Festival is something to be experienced! The beautiful Town Park Campground can be a fun, social camping experience that is a short stroll from the festival. It does get chilly at night so, pack appropriately-rated sleeping bags and gear. In the event of rain, a ground cloth or tarp does wonders. In addition to the Main Stage, the Telluride Jazz Festival offers an abundance of programing! Brought to you by the generous support from the Dalton Family Foundation, Dworbell Inc., the Raynier Institute & Foundation, The Telluride Foundation and Telluride's Commission for Community Assistance, Arts, and Special Events (CCAASE). On Friday and Saturday nights, after the festival ends in Town Park, we continue the music with “Jazz After Dark” shows located in various venues throughout Telluride. One pass allows entry into three different shows. The 2018 Jazz After Dark schedule includes shows from Jaimoe's Jasssz Band at the Sheridan Opera House, Polyrhythmics at The Moon at O'Bannon's and GoGo Penguin at the Liberty Bar & Lounge on Friday night. Along with Turkuaz at the Sheridan Opera House, No BS! Brass Band at The Moon at O'Bannon's and Nachito Herrera Trio - "A Night in Habana" at the Liberty Bar & Lounge on Saturday night. Jazz After Dark passes allow access to all venues for the night purchased. Be aware, Jazz After Dark passes do not guarantee entry to the show, all venues are first come, first served and based on the capacity of each venue. As they fill up, we direct you to which Jazz After Dark venues are not full. As the night goes on, crowds at the Jazz After Dark tend to rotate, so even if you can't catch the start of the band you want to see, there's a good chance you can catch the last half of their show. So, if there is one particular band you really want to see, get in line early for the show! After the shows begin, entry is dependent on capacity. The Patron Pass includes entry into all Jazz After Dark Shows and priority early entry. For the Jazz After Dark schedule, click here. The Patron Experience features a private opening concert with Sammy Miller and the Congregation at the historic Sheridan Opera House on Thursday, August 2 at 9 pm. Set in the heart of downtown Telluride, the opening concert is one of many festival enhancing amenities included in the 2018 Patron Experience. Other Patron Pass benefits including a one-of-a-kind, on-stage viewing area accompanied by a full stage-side hosted bar, catered meals by festival chef, craft cocktails and much more. For more info or to purchase tickets, click here. Following the “Jazz After Dark” shows, a new late night series named “Liberty Sessions” will take place at The Liberty Bar & Lounge in downtown Telluride. Free and open to the public, the series will feature the series will feature The McCarthy Trio on Friday evening and the Telluride Student All-Stars Jazz Ensemble on Saturday. Shows begin at 11:30 pm. Start your Telluride Jazz Festival mornings off with pleasant live jazz music, coffee and breakfast at the Phoenix Bean Saturday and Sunday of the Telluride Jazz Festival. New for the 2018 festival, “Coffee, Muffins and Jam” will offer a jazzy wake-up to a full day of music. Enjoy performance hosted by Jack Kotz and Bob Hemenger, along with a variety of breakfast dishes, baked goods and coffee drinks from the Phoenix Bean in the heart of downtown Telluride, steps away from the “Society Stage” at Elks Park and minutes away from the Telluride Town Park Main Stage. The music-jams will go from 9 to 10am (MT) both Saturday August 4 and Sunday August 5 and is open to the public. Start your morning off right with First Note Yoga! Enjoy a fluid yoga flow, activating breath practice, liberating movement and playful exercises to discover new realms of embodied pleasure. Guests of all skill levels are welcome to join us on Saturday and Sunday mornings at 8:30 am in Elks Park during the Festival weekend. Participation is free, no registration required. Discover the past with Saturday morning's Historical Walking Tour presented by the Telluride Historical Museum. Presenter and long-time resident Ashley Boling will guide visitors through Telluride’s storied past and celebrated landmarks. This tour is sold out, ticket holders can meet at 9 am in front of the Courthouse, across from Elks Park on Colorado Ave (Telluride’s Main Street). All festival pass holders receive free admission to the Telluride Historical Museum throughout the event. Festival attendees will have the chance to visit the museum and learn about the region's rich Ute Native American heritage, mining, ski and festival history. Show your festival wristband for museum entry. The Museum is located at 201 W Gregory Ave.
Second Line Parades are a New Orleans tradition. Brass-bands take to the street, play and march. Onlookers who followed along to enjoy the music were known as the second line. On Sunday, August 5 at Noon, join the Festival staff, attendees, No BS! Brass Band and Hooligan Brass Band at Elk's Park for a Second Line Parade down Main Street all the way to Telluride Town Park. Everyone is welcome! Colorful floats, costumes, beads and decorations are all welcome as attendees join in on the march through town. Drinks at the Festival - The beer, wine and cocktails will be served throughout the festival. Sierra Nevada Brewing Co. will be serving up a full menu of craft beer including the celebrated Pale Ale, Hazy Little Thing IPA, Nooner Pilsner, Beer For Drinking hoppy blonde ale. Read more about the craft beer menu here. Red Diamond will be serving wine and Peach Street Distillers will be crafting cocktails. Patron and VIP Experience pass holders will be treated to an open bar featuring a menu of deluxe craft cocktails! 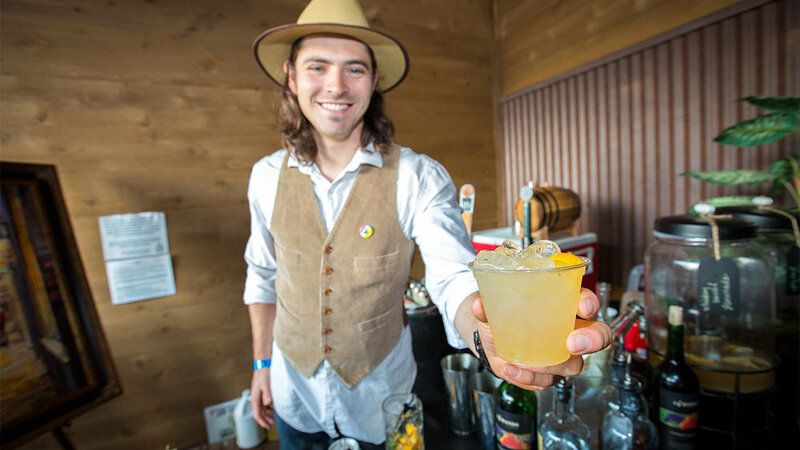 The Patron and VIP Craft Cocktail Menu - The sophisticated menu of craft cocktails at the 2018 Telluride Jazz Festival is the perfect touch to round out the elegant Patron and VIP Experience. The extensive selection of craft cocktails featuring premium vodkas, gins and tequilas prepared by co-owner and operator of Telluride's cutting-edge bar and restaurant, "there...", Jonathan Yaseen, will keep you feeling festive all day long. From original creations like, "Ella’s Old Fashioned", "The Duke Duck" - Duke Ellington’s Duck Fat Sazerac to twists on classics like Satchmo's Bloody Mary & Maria Bar the menu is an inventive masterpiece. See the full menu below and get all of the details here. Drinks on the Town - There's many great establishments to grab a beverage in the Town of Telluride. New Sheridan - Go shoot pool and play some foose in this historic old-timey bar. Great vibe, music and drinks. Oak: The New Fat Alley - Grab some fried okra and a pint of Schlitz on the patio! The best place to mellow out during the festival and eat great BBQ. Smuggler's Brew Pub - With a diverse menu and extensive beer list, this restaurant is not to be missed! Be sure to try the seasonal beer styles. There - A diverse collection of cocktails and food menu, a fusion of the new with the old, the trendy with the traditional. Staff suggestions: Grapefruit martini, Blueberry Gin jam cocktail. Telluride Brewing - Take a trip out to Lawson Hill and check out Telluride’s microbrewery. Fresh beer from the source and brewery tours available. Tomboy Tavern - Wraparound bar, oversized leather couches, beer garden and patio in the heart of Mountain Village. Poacher's Pub - Classic American menu with a sunny patio and wide selection of food and drinks. Cornerhouse Grille - Casual dining in Telluride with a great selection of traditional pub fare. Check out the specials menu! Click here for a full list of bars in the area. Patron Experience Dinning - Putting a priority on a high quality culinary experience this year's Patron Experience features an eclectic menu served in an exclusive, covered Patron Lounge located in the backstage area of the festival. Tantalize your taste buds with this delicious 'tour de food' presented by Telluride chef Josh Klein. Patrons can also enjoy fine dinning at Rustico Ristorante during Thursday's Opening Reception! Food on the Town - Telluride is filled with a variety of great dinning experiences. Brown Dog Pizza - Brown Dog Pizza is located on Main Street and has delicious pizza, subs, salads and beer on tap. Also, late-night slices! Siam - Fun fact: some of the best Thai food in the world is found in Telluride! Staff suggestions: Drunken Noodles, Pad Thai and Molly's Lobster Tempura. Floradora - Looking for the best burger in town? Check out Floradora on Main Street for delicious burgers (get the Matty Burger), jalapeño poppers, salads, sliders and more! New Sheridan Chop House - Easily some of the best food in town. You can eat two ways – very nice or laid back. ‘Very nice’ consists of sitting down for a nice steak and glass of wine. Or you can eat ‘Laid back’ by sitting at the bar or in the Parlor Bar for an informal meal with the same tasty menu. Tasty brunch, too. Baked in Telluride - Great spot to grab coffee and a quick breakfast in the morning - "B.I.T.” offers bagels, doughnuts, croissants, muffins, pizza, sandwiches, cookies and a whole lot more. Cosmopolitan - Hands down the best happy hour in town! Half-price sushi and Cosmos from 5:00 -6:00 p.m. every day of the week! La Cocina - Delicious menu featuring local and organic Mexican food on Main Street with indoor and outdoor seating. Pescado - Looking for some good sushi? Our friends at Pescado have some of the best in Colorado. Follow them on Twitter for special deals! La Marmotte - A modern take on elegant bistro fare. An excellent romantic getaway tucked into one of Telluride's oldest building. Staff suggestions: Roast Quail, Short ribs and Molten Chocolate Cake. For a list of Telluride restaurants, visit Telluride.com's Dining Guide. Hands down, Telluride is one of the best towns in the world for outdoor recreation! The towering peaks of the San Juan Mountain Range offer adventure for novices to pros alike. Hiking - If you’re up for adventure, there are plenty of beautiful hikes starting directly from downtown Telluride to explore: Bear Creek Trail is less than one block from Town Park (S. Pine Street) and is a perfect beginner trail up to a waterfall. If you seek a more challenging hike, check out the Jud Wiebe Trail (N. Aspen Street) which takes you to a gorgeous overlook of the entire town. Mountain Biking - Miles of mountain bike trails span the Telluride box cannon. Beginners should start with the Valley Floor Trail. Experienced bikers might consider the Prospect Trail Loop off of the Telluride Mountain Village Gondola. Scenic Off-Road Drives - Many scenic paved and backcountry roads weave through the peaks and valleys of Telluride. For those without a four-wheel drive car, HWY 145 South towards Dolores offers stunning views of the Telluride Valley, Wilson Mesa and Lizard Head Pass. Those with a four-wheel drive, high clearance cars can consider a trip to Bridal Veil Falls. Ride the Gondola - The only FREE transportation of its kind in the country, Telluride’s Gondola is a must-do while visiting during the week. If you don’t journey up to the free concert on Thursday night, make sure you take the time to check out this spectacular ride. Get out up top (Station San Sophia) to hike around or ride the Gondola down into Mountain Village to check out the local bars, shops and restaurants. The Gondola runs from 7:00 a.m. to 12:00 a.m. on Thursday, 7:00 a.m. to 2:00 a.m. on both Friday and Saturday, and 7:00 a.m. to 1:00 a.m. on Sunday of the Festival. Paddleboarding - Located 27 minutes South of Telluride Trout Lake offers stunning paddleboarding with beautiful alpine views. Paddleboards can be rented locally at BootDoctors™ Paragon Outdoors. Fly-Fishing - Telluride is an angler’s paradise. Alpine lakes, creeks and rivers are frequent throughout the Telluride region. For more information about fly-fishing click here. For more information about hiking, diving, paddleboarding, fly-fishing and biking in Telluride’s visitor guide. Historical downtown Telluride is home to an abundance of great merchant shops and art galleries. From boutique clothing shops, inviting art galleries, and unique Victorian architecture, it’s easy to spend a day exploring. Click here for a full shopping guide.